They say that good things come to those who wait. Well, Griffin Technology, the creator of award-winning and thoughtfully designed mobile accessories, has previewed their WatchStand a couple of months ago, and here we are with the official availability of the device. What makes the Griffin WatchStand so special? It happens to be the very first Apple Watch accessory from the company, of course. The WatchStand is a simple yet elegant charging dock that will not only deliver an effortless, safe and secure place to show off and charge your Apple Watch when it is not being worn. The WatchStand will show off the Apple Watch on a sleek pedestal, where it can also be placed on any nightstand, tabletop or desktop in order to deliver a platform for convenient daily charging. The WatchStand holds the Apple-provided magnetic charging cable in an angled cradle which will keep it ready so that it can be called to action to charge at all times. Piecing it together at first is a snap, as the user will just have to feed the magnetic charging cable via the center of the post, and when one would like to charge each day, all that one does would be to lay the Apple Watch against the cradle, and you’re good to go. The magnetic connector will then gently snaps itself onto the back of the watch, and voila! The charging process will begin. The versatile WatchStand will play nice with all versions of the Apple Watch, where it will then hold it at an easy viewing angle even as it charges. It will also work with both semi-flexible and fully flexible bands, as the WatchStand securely displays and charges the Apple Watch regardless of whether it is in a vertical or horizontal manner in order to deliver the perfect view every single time. The WatchStand’s weighted base will also have a place for a handset, too, where the raised lip on the front of the dock will carry the phone at the perfect angle for easy viewing. 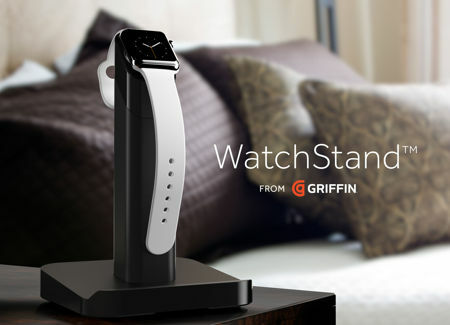 All in all, the Griffin WatchStand will retail for $29.99 if you are interested.